I used your software to remove password of PST files. 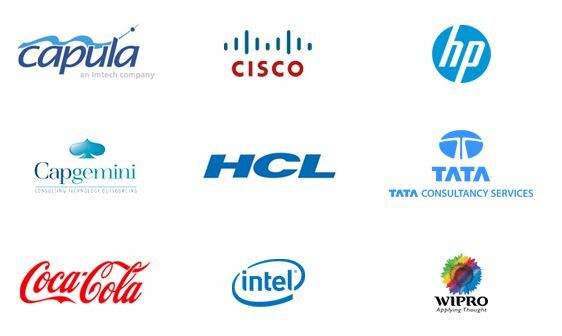 We had problem that user forgot his password and I had to resolve this issue, Your software solved the problem and I am thankful to you. This PST password recovery software quickly recovers forgotten or lost passwords of Personal Storage files (PST) of any version of Microsoft Outlook. What-so-ever may be the length and complexity of the passwords, the software instantly recovers all the passwords. 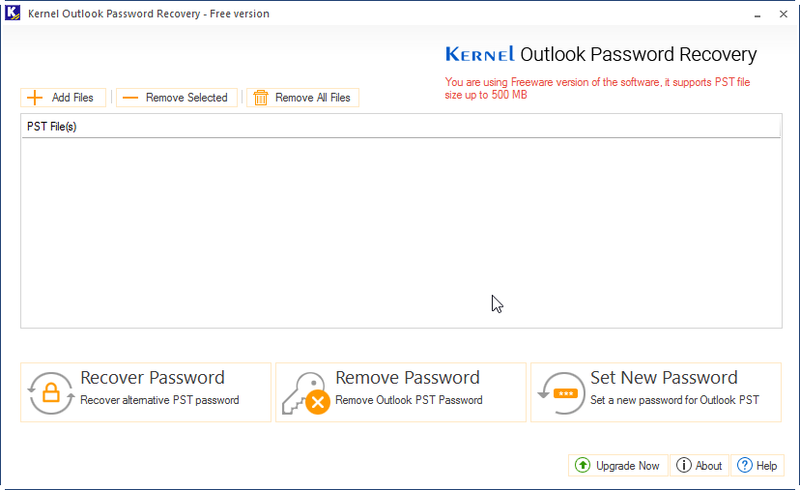 Kernel for PST Password recovery software tool restores PST passwords so that you can access all your email messages, appointment list and contacts. This tool can help even in situations when the network administrator is unable to assist you in regaining or reviving the forgotten password. In addition to the long and complex passwords, this tool can deal with the recovery of multilingual passwords. It can retrieve passwords in any language with utmost accuracy and efficiency, allowing user to access their emails. This tool performs password recovery even in conditions where encryption and complexity of the password is quite strong. In such cases, an alternate password is generated by the recovery tool to unlock the PST file. This tool is enabled with a ‘Remove Password’ function which allows user to remove passwords from password protected PST files. It works with small and large PST files and users can easily make their PST files free from passwords. 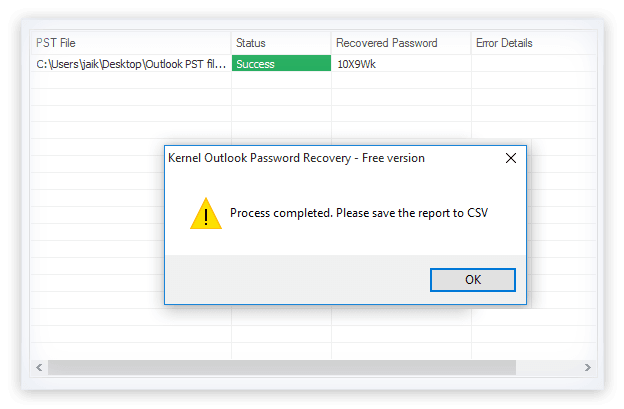 Using this Outlook password recovery tool, users can quickly change the password of Outlook PST files which are already password protected. So this feature is beneficial when you have forgotten or lost the passwords of PST files. The tool is designed with an intuitive interface that allows any user to operate it. It doesn’t require the user to be technically sound. The unlocking of your PST file is performed in a single click after the selection of the PST file. Simply download, install and start using it absolutely free. The password recovery freeware allows you to recover, remove or reset the PST file password to access the data for entirely free of cost. Just download, install and start using! Imagine if you forgot the password of your Outlook (PST) file, all your email messages, appointment lists and contacts will be lost. 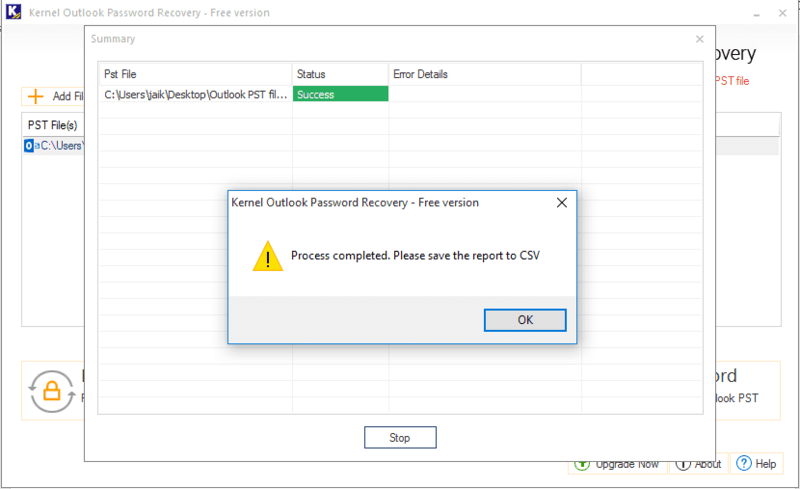 Download Kernel for Outlook Password Recovery immediately to recover your lost password. 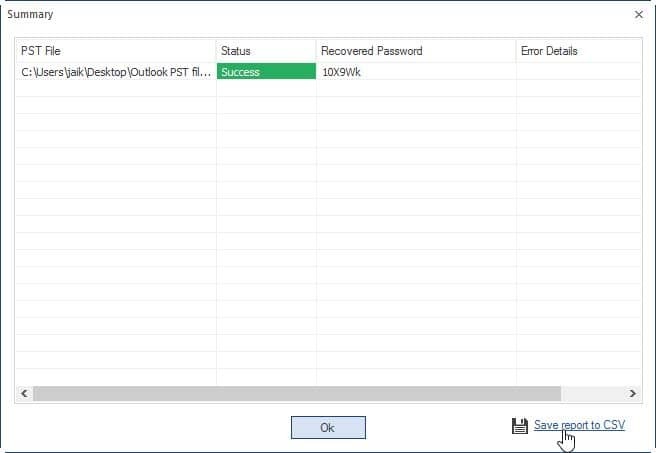 The Software lets you recover, remove, and set new password to any Outlook PST file. You can choose to select unlimited number of files and it will bring all the password to you. You can also save a report of recovered password. 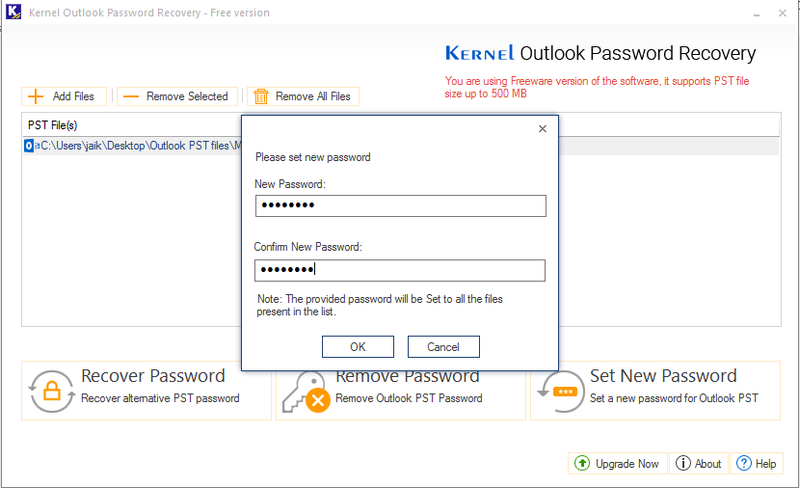 The steps inform you easy way to recover the Outlook files password. Add Add PST file for password recovery. 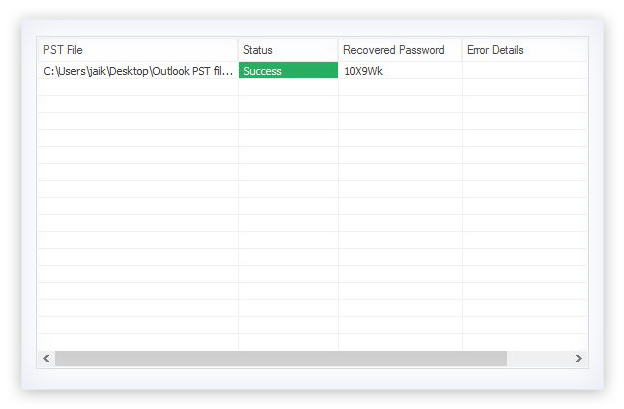 Recover View the PST password after successful recovery. 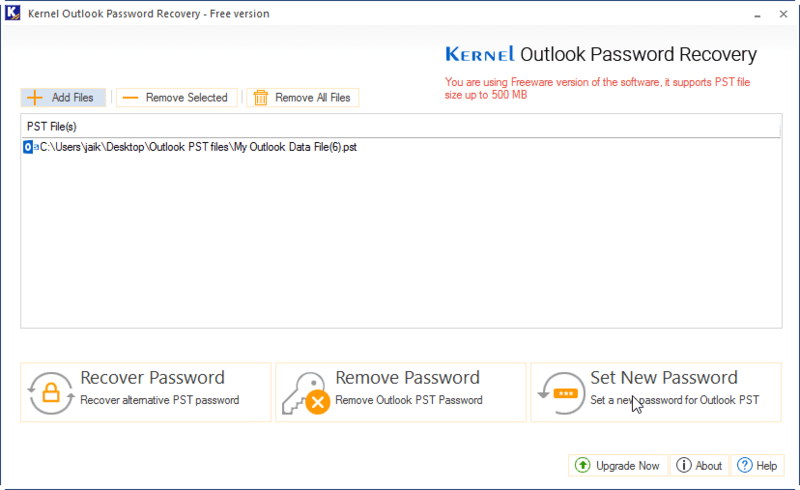 How to recover PST password with Kernel for Outlook Password Recovery software? 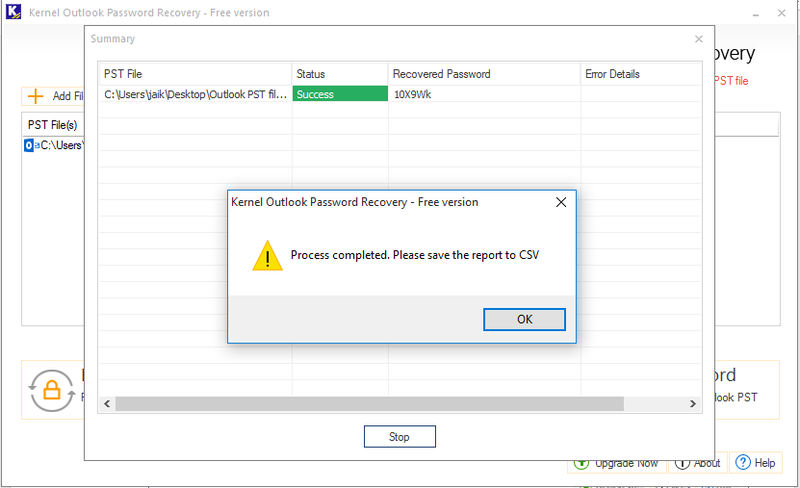 Click on Add File(s) button and select Recover Password and save the recover report once the process gets completed. You can select Remove Password for removing password from the PST file and save the report to CSV file format. Also, if you want to set a new password for PST file select Set New Password and save the report. I’m using Outlook 2013, does the tool support recovery for this version? Yes! This tool supports different Outlook versions including 2013. You can easily recover PST password. How will I be able to retrieve the password? The tool is quite simple to use. You just need to specify the file whose password you want to retrieve and it will extract the password immediately on clicking ‘Recover Password’. Can this tool help to repair corrupt PST files as well? No, this tool’s functionality is limited to password retrieval. 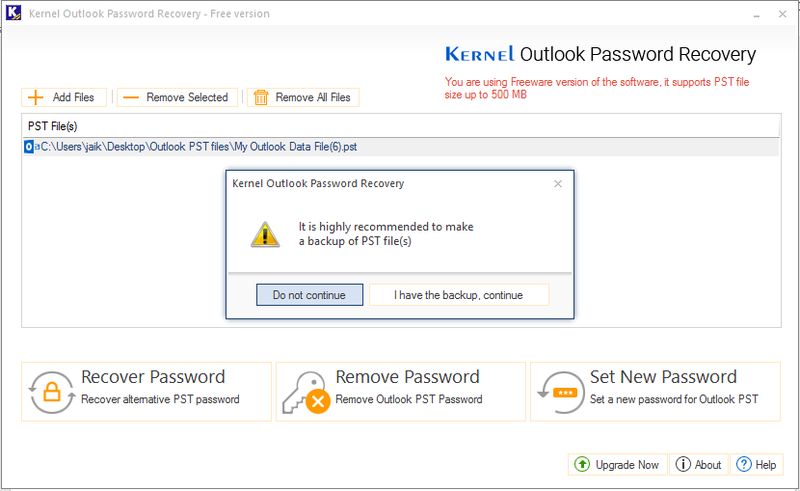 For severely damaged or corrupt PST files, you should install Kernel for Outlook PST repair. Can I unlock any PST file? I mean to ask not about my own PST file, but of others. Yes, you can. The tool is designed to recover passwords of any PST file. But the PST file should be a healthy file & not a corrupted one. I have saved my PST password using a French word with some symbols which I have forgotten. Can I get back the exact password? Yes, you can. If your password is too complex, you can get an alternate password for your protected PST file. This alternate password works just like your previous password to open your PST file. Is there any limitation on the PST file size for recovering the password? Yes, you can upload a PST file of size up to 500 MB while using the free version of the software. Really amazed by the performance of the tool, it worked so well with my old version of Windows. I was very skeptical about its performance with this much old Windows, but I didn’t face even a single problem regarding that. "Cool software works smoothly on my Windows 10 Pro and the size is effectively small the download was complete in seconds." "I am so impressed with the demo versions of the software they offer they work equally amazing as the full version does." 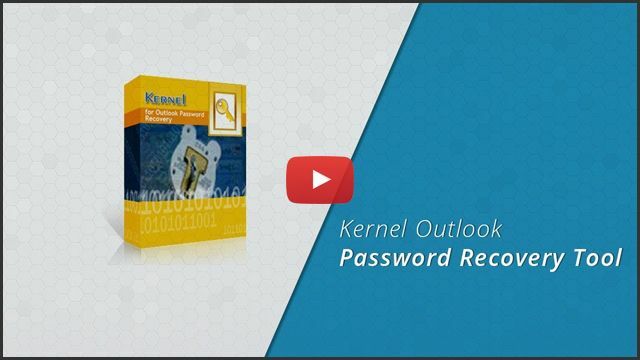 Launch the Kernel Outlook Password Recovery tool. Add the PST file and click the Recover Password button. 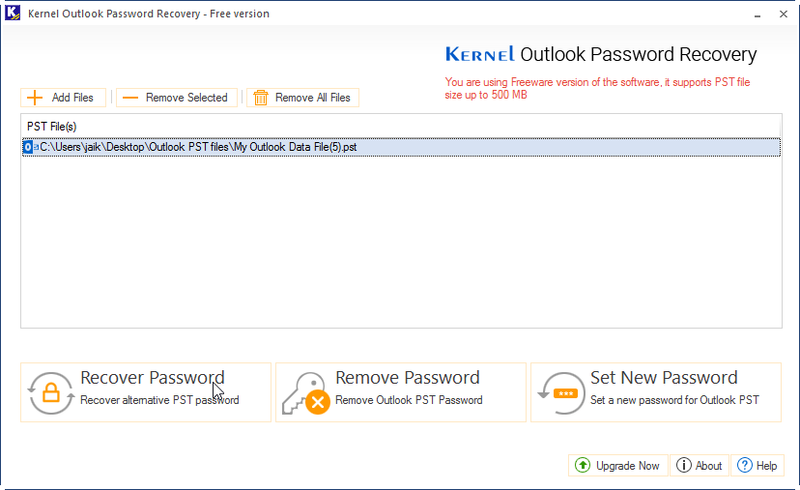 Recovered Outlook PST password is displayed. Add a PST file and click the Remove Password button. Back up the PST file before password removal. Password gets successfully removed from the PST file. Back up PST file before password resetting. Provide a new password for Outlook PST file. New password gets set for the Outlook PST file. Save the password resetting report to PST file. 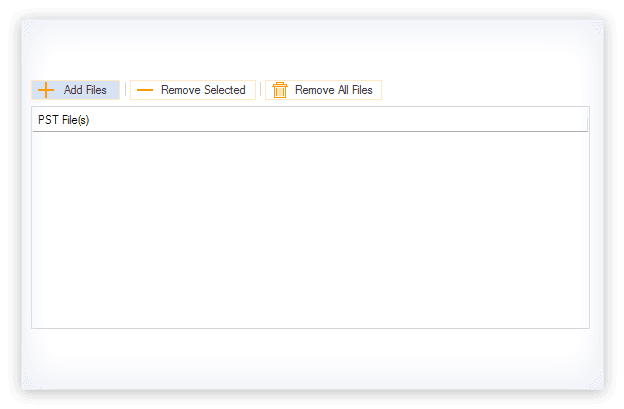 Remove and manage Outlook duplicate items from Outlook PST files.